Mary Cheney Gould, 79, of Blue Hill, shown in 2003, helped found the Bagaduce Music Lending Library. 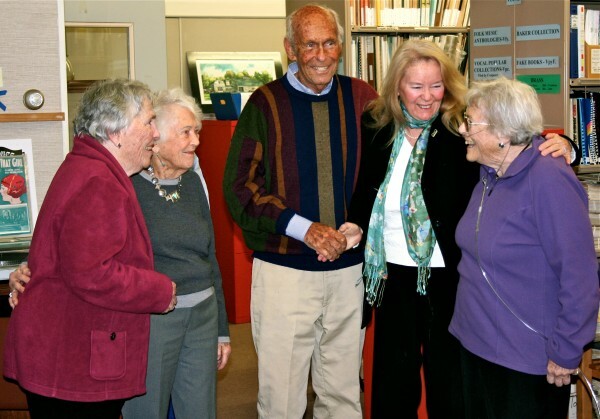 Bob and Jan Marville (center and far right) have given the former Liberty School property to the Bagaduce Music Lending Library in Blue Hill. 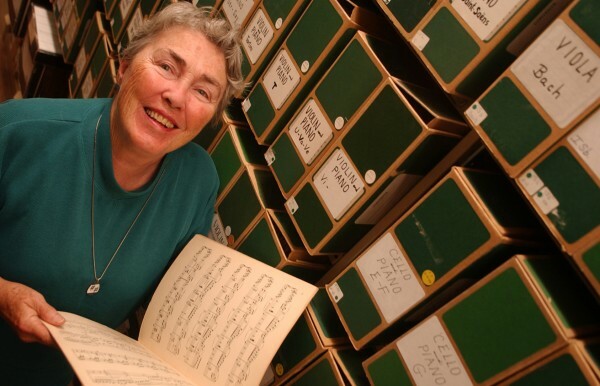 BLUE HILL, Maine — The Bagaduce Music Lending Library has for more than 30 years provided a home for over 250,000 pieces of sheet music, from 18th century Bach concertos to traditional American folk songs to contemporary jazz, all collected in a barn on Greene’s Hill. Members from all over the world borrow music from the library, which holds many rare and out-of-print compositions. Now, with a gift from two community members and longtime supporters, the 31-year-old nonprofit organization can expand its collection, operations and programming. Bob and Jan Marville have given the former Liberty School property, located on South Street, to the library. “Jan and I have been longtime supporters of the music library, and this donation is a confirmation of our strong belief in its mission and its future,” Bob Marville, founder of the Parker Ridge Retirement Community and a former president of the library board, said in a recent press release. The Liberty School, which closed in December 2007, was an alternative high school that served around 60 students per school year for about 10 years. The 4-acre, four-building property will serve as the new home for the collection, as well as a future home for an approximately 150-capacity performance venue and educational facility. Steve Lindsay, Bagaduce Music Lending Library board president, was effusive about the potential the property gift holds for the organization, which was founded by Mary Cheyney Gould and Marcia Chapman in 1983 and counts such musical luminaries as Yo Yo Ma, pianist Andre Watts, composer Paul Sullivan and Noel Paul Stookey as its advisers. Library staff plan to move into the new facility as soon as a few renovations are completed. While no official timeline has been set, Herries said she hopes to start the move in the fall, and also hopes that the performance space, which requires the least amount of renovation, can be used as early as this summer. A capital campaign to raise money for repairs will begin in the coming months. For information about the organization or how to become a member, visit bagaducemusic.org.